In some places it is pretty clear where the Sierra Nevada ends. For a hundred miles or more there is a solid rock wall that reaches a height of two miles in the Owens Valley. There is no mistaking that the mountains end at the cliffs above Lone Pine. Likewise, it's an unmistakeable demarcation between the flat Great Valley and the Sierra Nevada foothills. But in the central and northern Sierra Nevada, the division between "Sierra" and "not Sierra" is a line not so easily drawn. From Mono Lake to the north, there are fault lines that mark the edge of the Sierra Nevada structural block, but they diverge from the watershed crest of the range, forming a series of north-trending ranges and valleys. 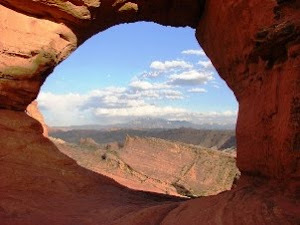 These ranges, the Bodie Hills, the Sweetwater Mountains, the Pine Nut Mountains, and the Carson Range, are connected directly to the Sierra Nevada, are composed of rocks related to the Sierra Nevada, but are often considered "not" the Sierra Nevada. Geologically, the Sierra Nevada block is moving northwest from the adjacent Basin and Range province, making it a so-called "microplate", a much smaller version of the North American or Pacific tectonic plates. The mountains mentioned above are the jagged edge of the incipient plate boundary that has not yet completely separated from the rest of North America. 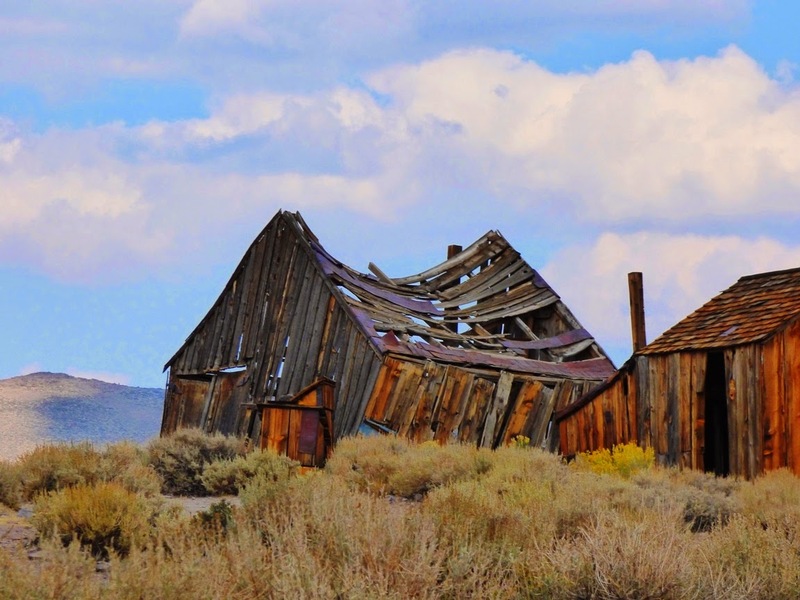 If you are patient enough, buy up some desert scrublands in the Great Basin of Nevada. In a few million years they may be oceanfront property! Our journeys last fall through the "Sierra Beyond Yosemite" took us over Sonora Pass and into the lands east of the Sierra Nevada crest, a land that is both "Sierra" and "not Sierra". 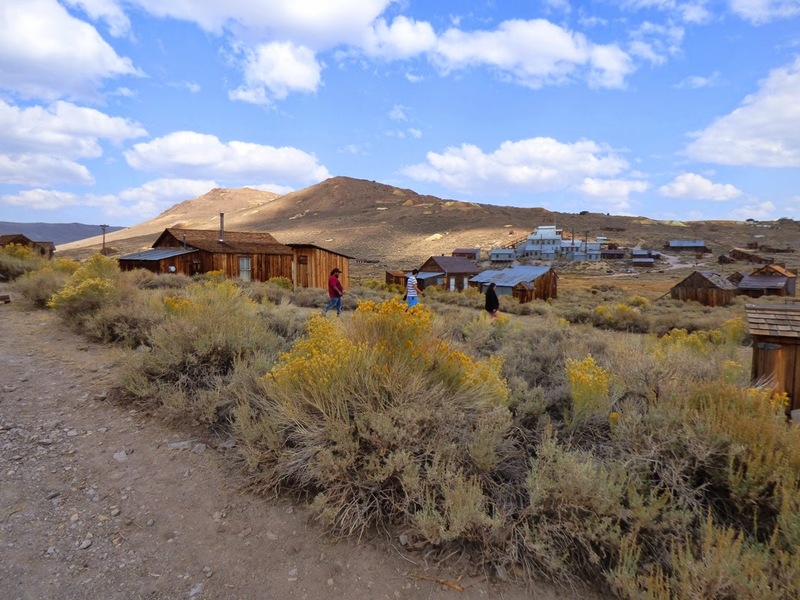 Our first destination was the ghost town of Bodie, between Mono Lake and Bridgeport Valley in the Bodie Hills. "Hills" in this instance is a deceiving term. 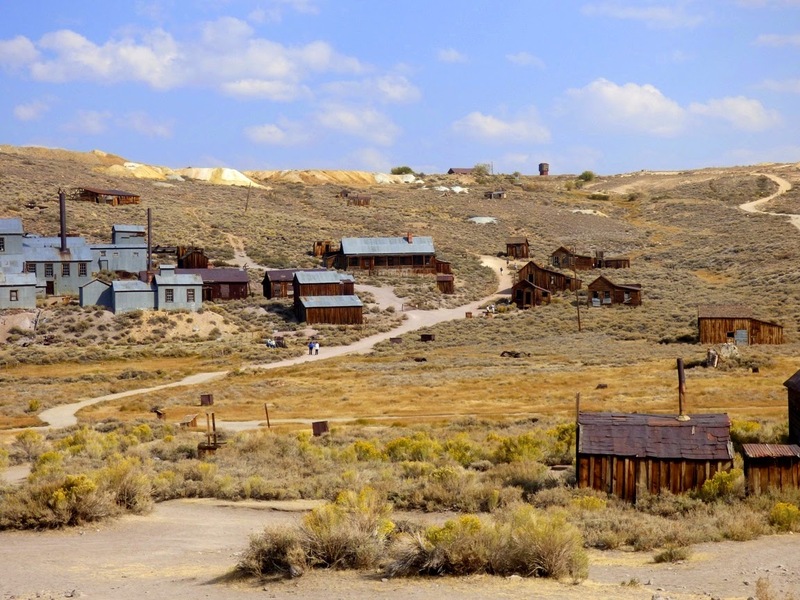 In any other setting, the Bodie Hills would be considered mountains, reaching elevations of more than 9,000 feet, and rising steeply above the Mono Basin. Still, the hills around the ghost town are more gently rolling, having not been glaciated, or deeply eroded by rivers. They lie in the rain shadow of the main Sierra crest, receiving only 12 inches of precipitation a year, making the region technically a desert (in climate terms, a dry-summer subarctic environment). Bodie competes with Barrow, Alaska as the place in America with the most freezing days per year: 308 of them on average. I just can't help thinking that this was a miserable place to live. Why would anyone...oh yeah, gold. 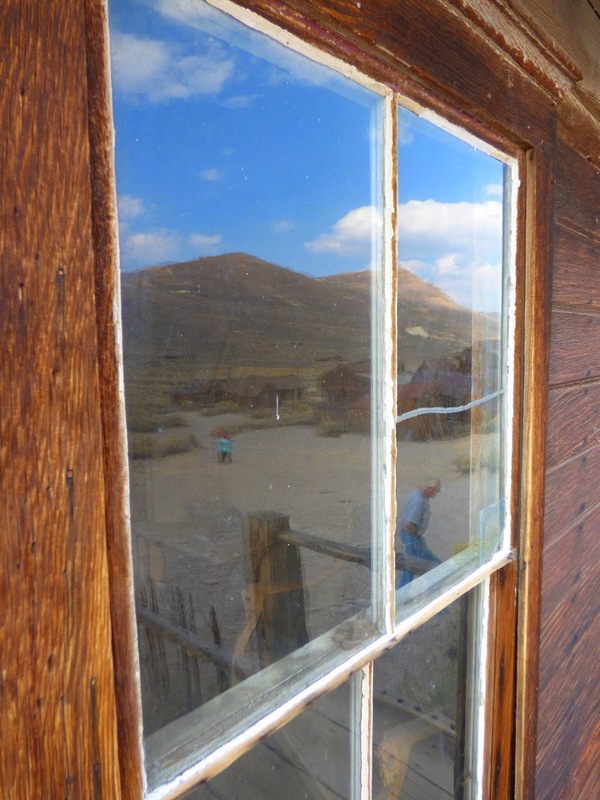 As I've described before, Bodie was a gold mining town. In the decades following the fabled Gold Rush, hungry miners started to explore the region east of the Mother Lode, and over the crest of the Sierra, and a lucky few found the elusive metal. 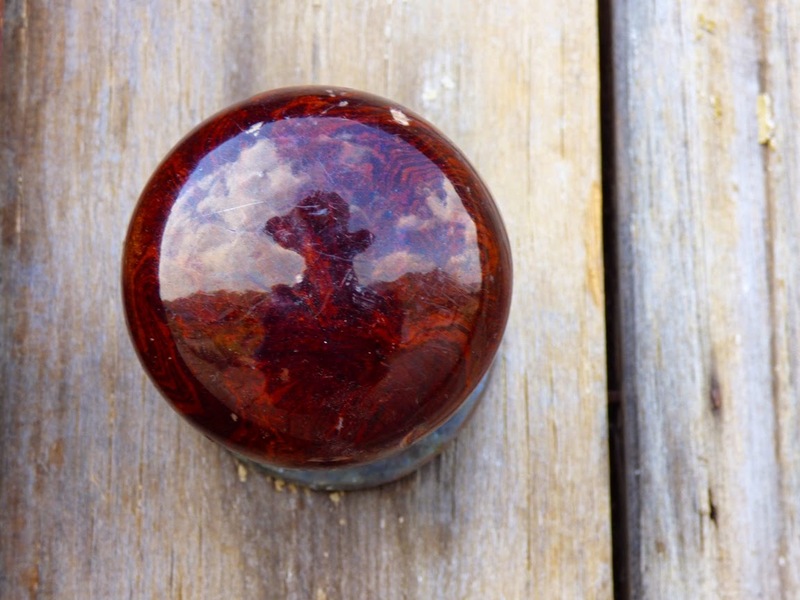 W. S. Bodey was one of these; his exploration party found gold in 1859 in what later came to be known as the Bodie Hills (apparently the spelling was changed to help with the pronunciation). He may have found the gold, but he wasn't lucky. He froze to death the following year while making a supply run near Mono Lake. The mines took some time to take off. 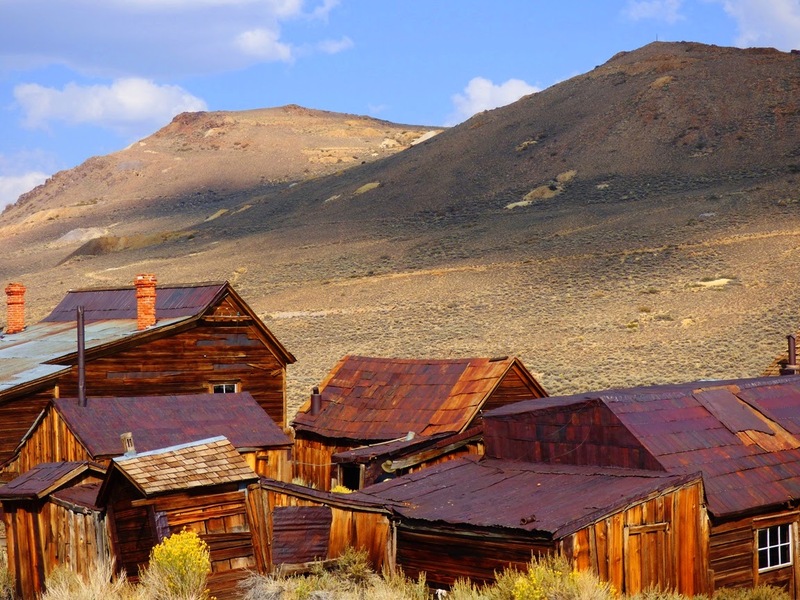 The discovery of a rich lode in 1876 led to the development of the Standard Mine, and thousands of people came to the town of Bodie. The population peaked at 10,000 in 1880. 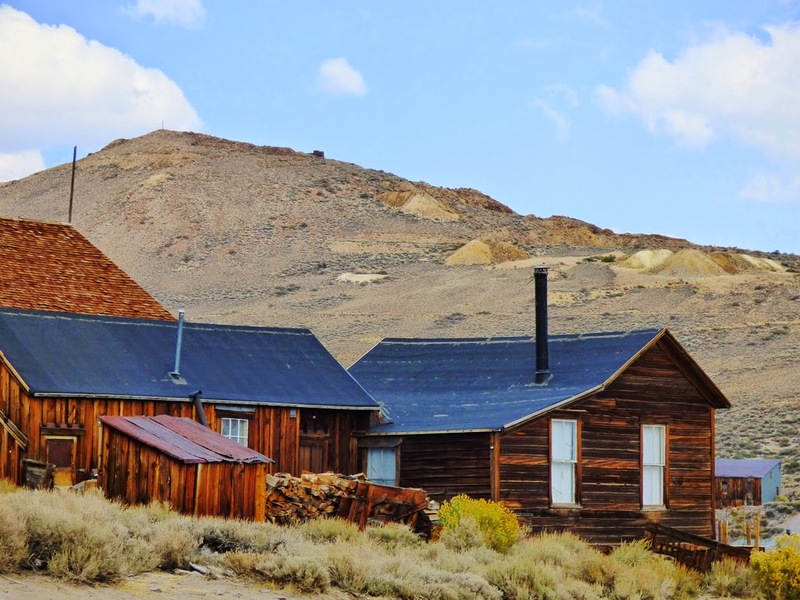 The town developed a fearsome reputation for lawlessness, and one legend declared that a young girl, finding that Bodie would be her new home, said "Goodbye God, I'm going to Bodie". The town had its pride, too: an editor of the town newspaper insisted the punctuation was wrong; she had really said "Good, by God, I'm going to Bodie". The mines were active for years, producing $34 million in gold (at a mixture of prices, $20/ounce in the 1800's and early 1900's, and $36/ounce in the 1930's). The gold is worth a great deal more at today's prices, perhaps $1 or 2 billion. As time went on, gold production waned, and the town began to die away. The Standard Mine shut down in 1913, although sporadic efforts at mining continued through 1942. A disastrous fire in 1932 destroyed most of the buildings in the town (only 110 of the original 2,000 buildings remain). 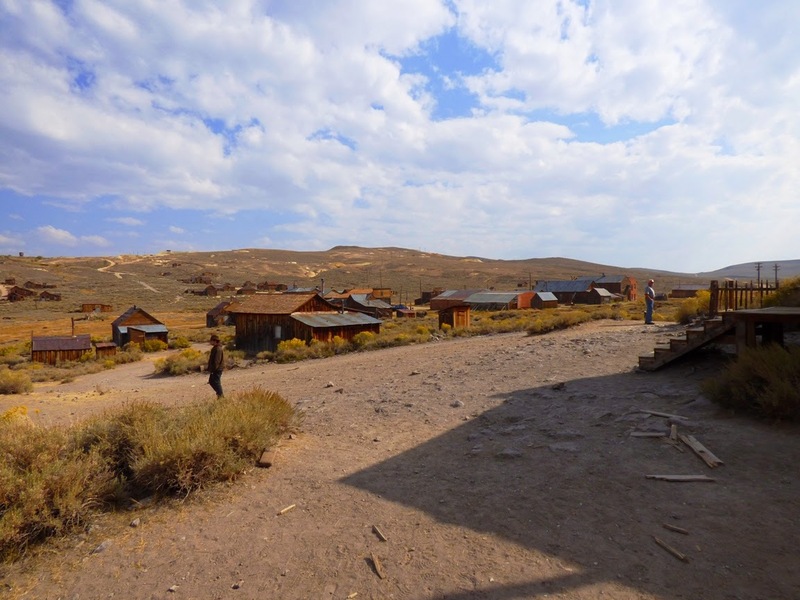 The gold at Bodie resulted from hydrothermal activity in the heart of a volcanic center that was active between about 14.7 and 8.0 million years ago. The field included at least 20 vents, including four trachyandesite stratovolcanoes. The town lies along the boundary between the deeply eroded Silver Hill and the Potato Peak cones, while the access road to Highway 395 meanders between the Willow Spring and Mt. Biedeman complexes. The sage covered hills reveal little of the volcanic violence that formed this landscape, but they do provide an analog for the appearance of the pre-glacial Sierra Nevada crest. 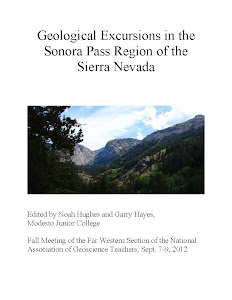 The alpine topography of the present-day Sierra Nevada crest is a very recent geologic event. Without the glaciers, the Sierra Nevada would have been a different place entirely. Today the town is a popular state park, and it has been declared California's official Gold Rush Ghost Town (as opposed to California's official Silver Rush Ghost Town in Southern California). I have a hard time envisioning a life here. I imagine that it was a relief on the coldest winter days to get out of the house or tent and get underground in the mines where it was warmer. Today, during a visit in the warm summer months, it is a photographer's playground, and an interesting place to learn about ancient Sierra Nevada geography. Garry, something's missing from my understanding. If the sierras were carved out by huge glaciers, why such a dramatic demarcation east of the crest? If the sierras were subjected to huge snowfalls and ice accumulation, wouldn't there have been less of a rain shadow east of the crest? Precipitation and snowfall increased during the Pleistocene Ice Ages, but the high wall of the Sierra Nevada still was every much a rain shadow as it ever was. There was enough rain to produce freshwater lakes in the desert valleys like Death Valley and Owens Valley. There were a few small glaciers in the high White Mountains on the other side of Owens Valley. But there was never enough precip to produce large glaciers. The same phenomena is present today in the Tibetan Plateau, and the Brooks Range of far north Alaska.